Videos, solutions, and worksheets to help Grade 6 students learn about terms, variables, coefficients and constants in algebra. 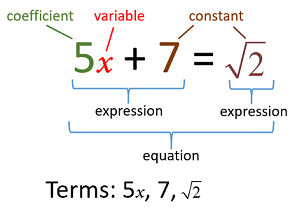 The following diagrams give examples of equations, expressions, terms, coefficients, variables, constants. Scroll down for examples and solutions. Terms are parts of an algebraic expression separated by addition or subtraction (+, -) symbols. A constant term is a number with no variable factors. It is a term whose value never changes. b. Identify the constant term. 2. Complete the table by listing the factors and identifying the coefficients. a. How many terms are there? c. What is the coefficient of the first term? d. What is the coefficient of the second term? e. What is the coefficient of the third term? f. List the factors of the fourth term. Defines terms and coefficients and variable part of a term in preparation for combining like terms. A variable expression contain one or more variable terms added or subtracted. b) any one of many numbers to indicate a general principle. A constant is a single number. A coefficient is a number "in front of" a variable.